Family of Oron Shaul warns Prime Minister over truce arrangement that leaves out MIAs, says it will backfire. The family of Staff Sergeant Oron Shaul, who was killed in Gaza in 2014 and whose remains are held by Hamas, fired off an angry letter to the Prime Minister and the Diplomacy and Security Cabinet over reports of a planned truce with the terror organization. 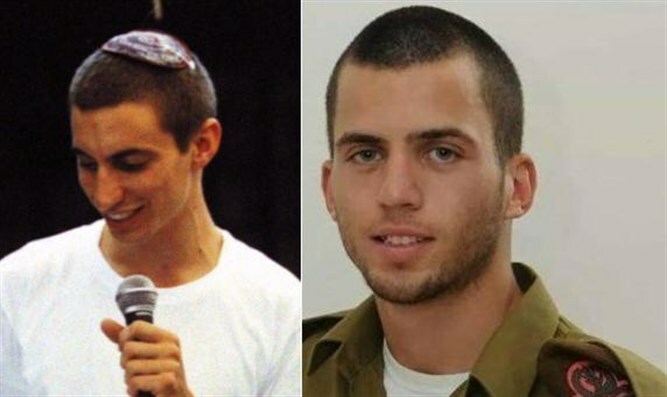 The family warned that any accord that does not include the return to Israel of MIAs Shaul and Hadar Goldin, as well as Avera Mengistu and other Israeli citizens being held by Hamas, will eventually backfire. Earlier, Lebanese website Al Akhbar reported that Israel and Hamas are working out a deal, in which the terror group will cease organizing riots on the border with Israel, and stop flying incendiary kites into Israeli territory. In return, Israel will reopen the Kerem Shalom and Rafiah crossings into Gaza. In the second stage of the truce, Israsel will increase the supply of electricity into Gaza and allow large-scale supply of goods. Following this, infrastructure projects to improve the quality of life in Gaza will be undertaken. Any agreement that does not include the MIAs "is not worth the paper it was written on," wrote the Shaul family. "Remember: all this will come back at us like a boomerang," said the family's letter. "For the agreement to have practical and moral value, the first item must be the release of our sons," it warned." Only thus will it be strong and worthwhile. An agreement that does not include the release of our sons is a surrender agreement that indicates… our country's weakness. It will empower our enemies to violate the agreement from time to time… without fear." The family also addressed Israeli citizens in general and the residents of the Gaza Belt in particular. "Our sons went out to protect you with their souls and bodies. They had the courage and the heroism. Therefore, morality and conscience dictate that you oppose an agreement that leaves behind our sons."